The Alpha Micro is unusual in that it appears to be the only computer that ever shipped with a Western Digital WD16 16-bit processor as its main CPU (WD being the company that would become much more famous as a hard disk manufacturer). It ran its own time-sharing AMOS operating system (this was thought to have been heavily influenced by that of the DEC PDP-11, so much so that DEC tried to sue in 1984 - see Wikipedia for more) and had an S100 Bus. It could support up to 24 terminals but, most impressively, could also support up to 2.4 gigabytes of disk storage - a frankly stratospheric amount in 1980, where many business machines still operated on about 16K of system memory and even in 1983 a 5MB drive for under £1,000 (£3,360 in 2019) was something to shout about. 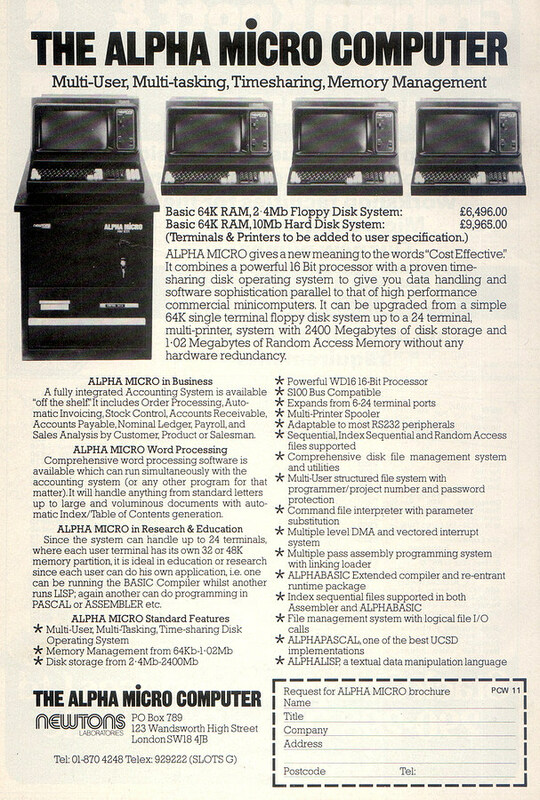 The basic machine with 64K RAM and a 10MB hard disk retailed for £9,965 - about £48,000 in 2019 money - the 10MB Winchester representing a £3,500 (£16,800) premium over the floppy-disk system. The Alpha Micro's S100 bus, which had been established and made famous by MITS' Altair 8800, had been around since 1975. The idea of a "bus" was simply a standard way of extending a processor and its memory out in to some sort of hardware connection for the use of, normally, plug-in cards like video adapters, laboratory I/O or serial boards for talking to printers and modems. Some machines, like Ithaca's DSP-1 offered over 20 slots for this sort of purpose. There were a few other bus standards around, in particular the SS-50 bus used by SWTPC's 6800 micro, but at the end of 1979 (as reported in December's Personal Computer World) they were joined by a challenger with a twist: the E78 bus, sponsored by the Amateur Computer Club. Many micros of the day, like Ohio's C3-B were "multi-processor" in the sense that they had several CPUs which could be switched in or out, but the twist with E78 was that this bus claimed to allow Motorola, Intel and Texas Instruments' 8-bit and 16-bit processors to run simultaneously - a neat trick in that different processors rarely, if ever, ran at exactly the same speed and all of them produced and required completely different signals. The attempt was coordinated by Alan Secker, who said "in order to assist small would-be manufacturers in producing various E78-compatible components, I am setting up a register and will arrange to co-ordinate between them so as to arrange for most of the components to be available, and complete systems to come onto the market quickly". No subsequent mention or use of the E78 bus seems to have been made, anywhere.